Since discovering a love of baking, my birthday and Christmas presents seem to have taken on a distinct theme. My designated baking drawer in our kitchen is getting fuller every time there's a special occasion. One of the recent additions was a Christmas present from one of my sisters. 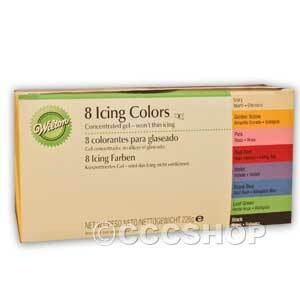 Wilton food colouring gels. I've previously used the Dr Oetker liquid colourings you can buy in supermarkets but sometimes have to use a seemingly massive amount to get the colour I want. The gels come in small pots resembling paint pots. A set of 8 colours will set you back somewhere between £14 and £18. Shop around online and see what price you can find. When making the rainbow cake I posted about a couple of weeks ago I used the gels, having read that they would give a much more vibrant colour than their liquid counterparts. I have to admit I was very impressed. A small amount produced a bright and rich colour. I'm someone who likes to use colourful frostings so these suit me perfectly. Highly recommended! I recently bought those and I am in love with them! They're really good for macarons, because as you don't need a lot of gel for intense colour results, it doesn't mess with the proportions of wet vs. dry igredients.